SOME things never seem to change, even in these turbulent times. And one of these is pantomime, apparently destined to last forever in its traditional well-loved format. This year’s pantomime at the Gaiety Theatre in Ayr “Snow White and the Seven Dwarfs” is as popular as ever, judging by the enthusiastic response of its audience of children of all ages, not to mention a sizeable representation of senior citizens. Mari Gordon-Price is a suitably terrifying Wicked Queen, Stephanie McDowall the charming heroine Snow White, and Bryan Reid the heroic Prince Charming. The music, song and dance numbers are outstanding, with a spirited rendering of “Dancing Queen” being particularly memorable. Gary Morrison plays Big Bad Ben and Andreii Matviienko the Man in the Mirror. But it is Ian Gouck who runs the whole show magnificently as the Dame, Doris Dumpling. To him falls the vital pivotal role of orchestrating the audience involvement, a task which he carries off with aplomb and to great acclaim. A successful and most enjoyable production, well worth a visit. 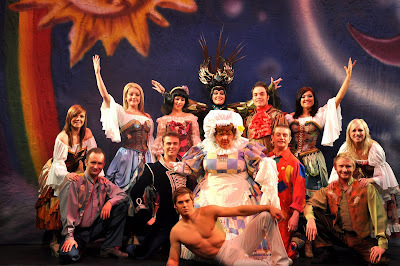 A South Ayrshire Council and Squires & Johns Presentation, “Snow White and the Seven Dwarfs" runs at the Gaiety Theatre in Ayr until 31 December 2008. There are currently 410 Ayrshire business stories permanently archived on this site. To locate those of most interest to you, please use the site search facility in the top left hand corner of this page. Type your search term in the white box, then click “SEARCH BLOG”.